My first impressions of this pellet were very good. It was pretty clear based on the smell that these pellets were some type of pine. Based on the color it seemed clear that the saw dust was of high quality in the way in which it was cared for. When the saw dust is left outside in the rain the color of the pellets begins to get dark which is a characteristic feature of a brand like Energex and it's various other labels. So upon first inspection I had very high hopes. After burning these for a while I would not say my hopes were dashed however there began to be some minor issues that appear. Before I talk about the negatives of big heat, let me talk about the positives first. 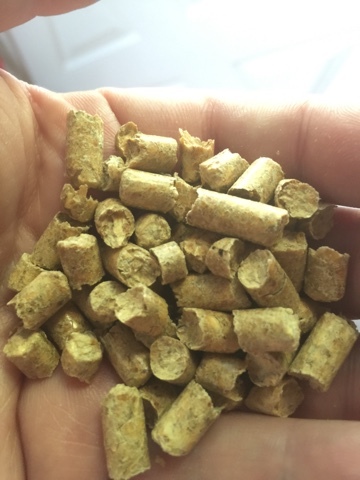 The first thing is that these pellets contain A high BTU content. I burn a Harman stove, and as such when I set the stove to a particular temperature it will feed the pellets accordingly to keep it at that consistent temperature by measuring the exhaust temperature. So one of the ways that I observed BTU content is to run my stove on low, and see how much time I get out of a bag of pellets. A Poor performing pellet will only burn for 15 or 16 hours, the best pallets I've ever burned have gone for 27 hours on a bag. These pellets did just over 24 hours, and that's really good. The second big positive to these is their price. I believe I paid something in the neighborhood of $265 for a ton, which is cheaper than stove chow in my area of northeast Pennsylvania. So here are the negatives I observed. 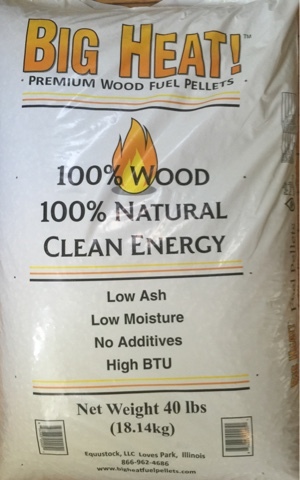 This pellet produces a dark somewhat heavy or ash, and as such the ash doesn't tend to blow away as much as some soft wood pellets. They do not produce an exceedingly large amount of ash, but because it is heavy it tends to accumulate on the burn pot. Secondly, I noticed there was a minor build up of clinkers. Neither of these issues were exceptionally bad, and would've been pretty typical of even a good hard wood pellet, but for such a nice looking soft wood pellet I expected it to be a little better. In the end the type of stove you have will determine how well these do for you. Because of their very high BTU content they have the potential to be an excellent value. I would definitely recommend picking up a few bags of these and trying them in your stove, and if they do well for you I think they will be a great choice. On my rating system of gold silver and bronze, I would give these a silver. what area did you purchase them from ....i live in pa and had major problems with these ..
After trying several pellet brands I chose Big Heat Pellets because they were dust free, produced the most heat out of everything that I've tried, and they smell better when they are burning. They are also cut very uniformly and all pellets are no longer than 1/2" for better feeding. But like all pellets, try a bag or two before you buy an entire pallet because each batch is slightly different than the last. I buy these and have compared them to barefoot, big heat has a much higher btu and I mix mine with corn to get the most heat I can. I recommend them. I have burned Big Heat in my 20 year old Austroflamm Integra 65 insert stove for 4 years now and have never experienced the symtoms that others have claimed. I clean my burn pot, ash pan out once a week and combustion area every two months. I do not accumilate clinkers and very very little ash build up ever. Best product I have used so far.....if its not broke...dont fix it! Thanks for sharing this amazing blog and the details about pellet really awesome. “White Lightning” hands down the best pellet you can buy.